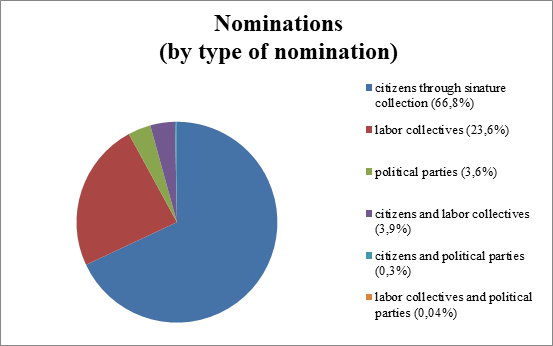 according to the CEC, 17,542 nomination groups were registered, which is 99.9% of the total number of nominations. 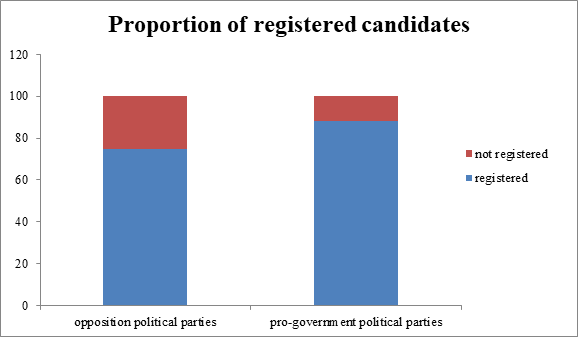 In the previous local elections of 2014, the registration percentage was 99.7%. 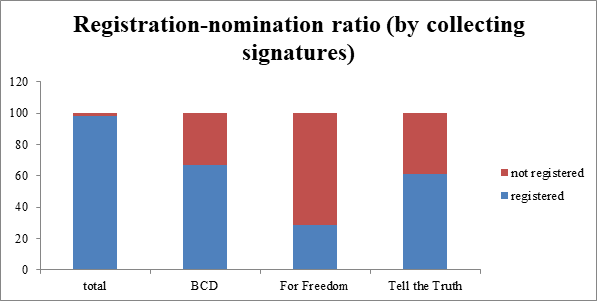 the election commissions did not create significant obstacles to the registration of nomination groups, with almost all groups having been registered. It should be noted that the election authorities registered all the groups formed to nominate members of political parties. 78% of the campaign’s observers were not admitted directly to the verification procedures and were not able to report a comprehensive and unbiased approach by the commissions. The observers were only able to attend the meetings where the results of verification were announced and decisions on registration were taken. This significantly reduces credibility of the work of election officials, calls into question not only individual decisions to refuse the registration of candidates, but also the decisions which allowed their registration. This gives reason to believe that the Belarusian authorities have not put into practice the recommendations of the OSCE ODIHR. 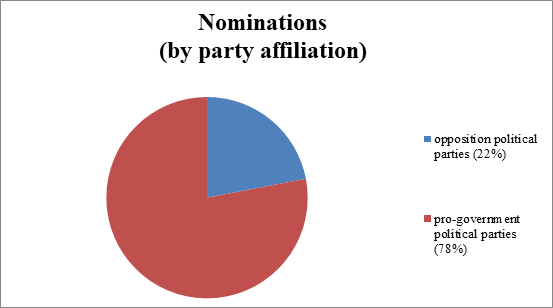 according to the CEC, 22,278 candidates were registered, which is 98.09% of the total number of nominations. 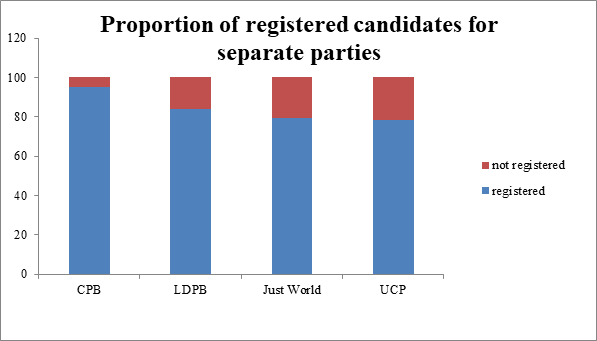 The percentage of registration of candidates from the pro-government political parties exceeds that of the opposition parties. 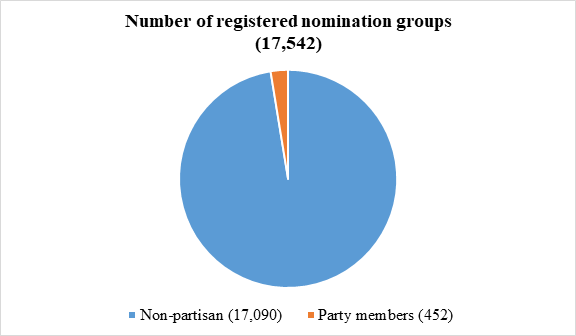 statistics of refusals to register and withdrawn nominations not only demonstrate the level of political intensity, but also the level of applying the technical procedures of registration (verification of signatures, declarations, etc.) in the political struggle. In particular, the number of refusals to register candidates for the Minsk City Council was 23%, the Councils at the district level — 1.5%, the rural councils — 0.3%. Analysis of the practice and quantitative data suggest that the audits were used selectively, primarily against opposition candidates.